Crease Brush(#224): I use the brush to contour/highlight my nose, chin, philtrum and any other little area. 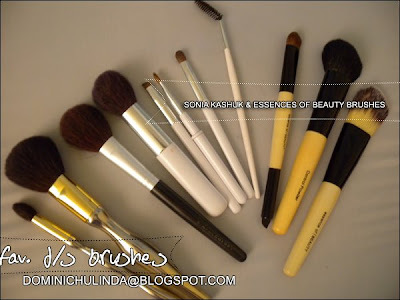 Blush/Powder Brush(#181): I use this brush for my MSF Blushes. For some reason this reminds me of the #181 on a stick. Blush/Powder Brush (#129): I use this brush to pack on powdersmy beauty powders. Blush Brush (#109): Love this to apply blush on the apples of my cheeks. A tad bigger than the #109, but similar. Angel Brush: Love this for my eyebrows (I would never need to get an eyebrow brush ..this one is so perfectly packed with the right amount of bristles). Lip Brush: I use this brush as a small eyecontour brush. It goes in my crease/under my eye so perfectly (the bristles are no flimsy). Small eyeshadow Brush: Packs on the colors so well. Smaller than the #239. Mascara Brush: Great for taking out the clumps from the mascara or brushing eyebrows in to place. Smokey eye Brush (#227): I use to apply highlight/Contour color on the face. Foundation Brush: I apply my moisturizer (it's in a jar) with this brush.